Flowserve is the recognized world leader in supplying pumps, valves, seals automation and services to the water industry, as well as others. With more than 14,000 employees in more than 56 countries, they combine their global reach with a local presence. Offered in a wide range of configurations, construction and materials, Flowserve VTP pumps are typically installed in a wet pit or deep well where NPSH (net positive suction head) available is usually not a problem. 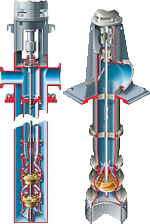 When a wet well is not available or there is insufficient NPSH available, the VTP pump with low NPSH impellers can be mounted in a suction barrel or can, which serves as the holding vessel for the liquid. With more than 300 bowl and impeller medium and high capacity designs, Flowserve provides unsurpassed hydraulic coverage, with specific speeds from 1500 to 5500, to ensure the best pump selection for a wide variety of services. The D800 Series of pumps has evolved as Flowserve engineers have reacted to the growing need for economical and reliable pumps for general industrial service. Covering a large flow and head range, the D800 is versatile and reliable. It is available in multiple configurations to suit site requirements and incorporates many proven features to reduce and facilitate maintenance. The Flowserve Pleuger submersible pump motors offer an extraordinary range of performance. The water filled and wet wound motors are environmentally friendly, provide high efficiency and offer great reliability.